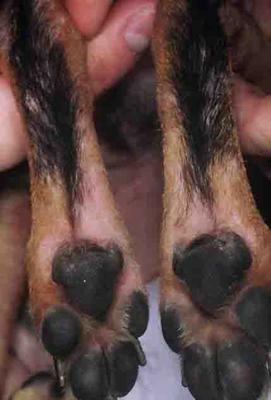 My dog has developed a skin rash on his inner hind legs that is spreading to belly button area and to inner fore legs. It is not responsive to Benedryl. It is not oozing, smelly, or bleeding, nor does it seem to be irritating as he does not pay much attention to it. The affected area appears red and is slightly less red in the center. The severity wanes and appears lighter at times. The edges of the area develop tiny scabs when it is waning. It is increasing in size. I was unable to include a photo. I have modified his diet from an inexpensive commercial blend to Simply Nourish lamb and oatmeal blend. It has been only a couple of weeks and I have not noticed a change so far that might be attributed to diet change. Because your dog’s condition is worsening despite treatment and has been going on for several weeks, it would be best for you to bring him in to see your veterinarian. The longer you wait, the harder it will be to get his symptoms under control. I’m afraid I can’t determine what might be going on in this particular case based on the information in front of me, but possibilities include a reaction to something his skin is coming in contact with, a skin infection (bacterial or fungal), an allergic reaction, parasites, and autoimmune diseases. If your dog were my patient I would start with a physical exam, most likely followed by a skin scraping to look for mites, skin cytology to rule out infection, and a fungal culture for ringworm. If those tests didn’t lead to a diagnosis, a skin biopsy might be necessary. Thank you, Dr. Coates. I am going to take my dog to the vet. I appreciate your response to my concerns. Have a great weekend. Join in and write your own page! It's easy to do. How? Simply click here to return to Dog Skin Rash.